Last week, Mayor Ravi Bhalla announced a new agreement with Suez, which would see over $30 million in water system infrastructure investments over the next 15 years. Over the next 15 years, Hoboken will invest $33 million in its water infrastructure system after the administration announced a new contract with Suez, the city’s water provider. The new deal was scheduled to go before the city council for approval on Wednesday, April 17. Some parts of Hoboken’s water system are over a century old. The cast iron pipes become brittle as they age, making them more prone to breaks caused by pressure fluctuations, vibrations, or changes in temperature. In order to close a city budget gap in 1994, the city sold the right to make money off the water system to United Water (now Suez Water.) The 30-year agreement was made in exchange for payments totaling $13.2 million for budgets through 2001, an effort to keep taxes from rising higher in those years. The city’s current contract with Suez Water only provides $350,000 a year for improvements, only enough for constant repairs. Last summer alone, Hoboken had 17 breaks over a six-week period which flooded streets, caused water-boil advisories, and flooded the PATH terminal. This influx of water main breaks led to the city filing a lawsuit against Suez Water in state Superior Court last August which has since been dropped. The council passed a resolution to solicit bids for a new water system operator in September. 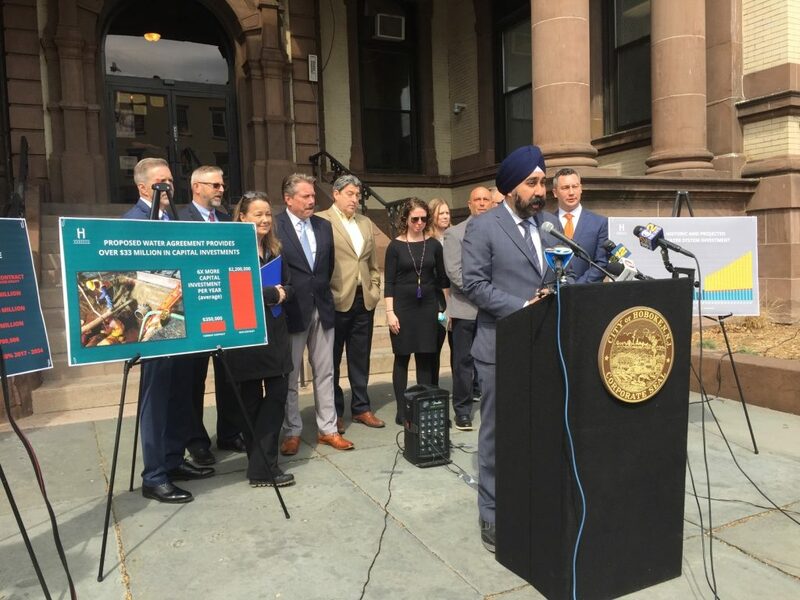 “Hoboken and SUEZ have agreed to a contract that will invest at least $33 million into upgrading Hoboken’s older water mains, which includes proactive investments of $2.2 million each year into our system, more than six times the amount of the current contract,” Mayor Bhalla said. The new agreement was based upon the framework of the initial Suez negotiations led by former Mayor Dawn Zimmer and her administration in 2017, according to Bhalla. As part of the new agreement, the water system would no longer be operated as a private water concession, but instead as a new public water utility. For a fee, Suez would continue to maintain and operate the water system, as well as be paid for any repairs or capital upgrades. However, all revenues generated from water bills would be collected and invested by the city instead of Suez. “The major paradigm shift is with the collection of revenue from the water main system, which will not be obtained by a private for-profit cooperation but it’ll come directly to Hoboken which will be able to control water rates and how we invest those monies,” said Bhalla. The new agreement also includes $2 million in smart leak detection technology which will use real-time data to identify leaks. Under the terms of the new contract, at least 18 percent of the city’s water mains will be upgraded by 2034, while the old contract upgraded only 5 percent of the system from 1994 to 2017. Councilman Mike DeFusco issued a statement on the contract following the city’s announcement last Friday. “Last year our city was on the verge of making a historic mistake in once again jumping into a protracted lawsuit that would only benefit lawyers instead of the residents of Hoboken, by entering into a lawsuit with SUEZ,” he said in a statement.